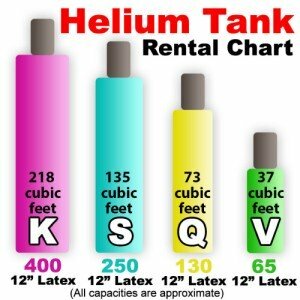 Helium Tanks: Should You Rent or Buy? Planning to decorate your party, wedding, or special event with floating balloons? Then you'll need a helium tank. The question is, are you better off with renting a tank or buying a disposable one? It depends. Read on to find the solution that's best for you. Like this balloon ceiling? Renting a helium tank is your best option for filling so many balloons [Image source: namaturak.cz]. 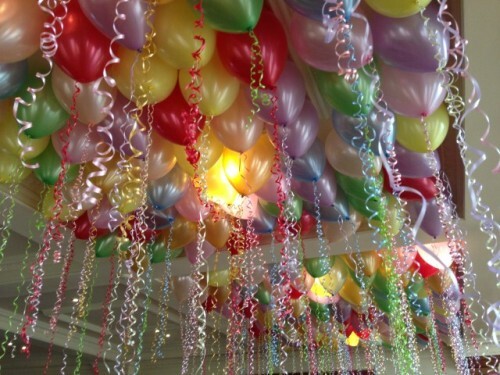 If you are planning an event where you'll be giving away balloons to your guests, or if you'd like to create such an amazing balloon ceiling as seen in the picture, you need more helium than you'll get with a disposable tank. Helium suppliers rent tanks in various sizes. The smallest ones fill about 50 x 12" latex balloons, and the largest ones over 500. Prices vary, but you can expect to pay about $40 for the smallest size, and $250 for the largest. They typically require a cash or credit card deposit that ranges anywhere between $100 and $200. The deposit is returned to you when you bring back the tank in working, empty condition. Check with your supplier if the required valve, pressure gauge and nozzle for filling your balloons are included with the tank rental, or if you need to rent them separately. If you are planning to fill mylar balloons, you may need a different type of nozzle, so make sure to ask the supplier about it. Will you need to move the tank around in your home or at the event venue? We recommend that you rent a so-called cylinder dolly or hand cart. These are carts specifically designed for the cylinder shaped helium tanks. Of course this will add to your expenses, but it makes it much easier and safer to move the tank around. Many helium suppliers offer delivery, but you can also transport the tank yourself. Don't forget to ask by when you need to bring the tank back, as you'll be charged extra for late returns. Now, how do you use the tank? How do you attach the valve and operate the nozzle? The video below explains this very well. Renting a tank can be quite a hassle. First, you'll need to find a supplier in your area. You have to drive there, pay a deposit, transport the tank and bring it back after the event, typically within 48 hours. Buying a disposable helium tank is much simpler. You'll get them for example at Walmart or Target. Or you order them online. They come with the nozzle attached to it. If you don't have a special balloon type or color in mind, you can go super easy and purchase a complete kit with tank, 30 assorted 9" balloons and white curling ribbon. Or you order the disposable tank on its own, and get the balloons (foil or latex) separately. This 14.9 cubic feet tank fills approximately 50 x 9" latex balloons, 27 x 11" latex balloons or 27 x 18" mylar balloons. Prices vary, depending on the supplier, but you can expect to pay about $30 for the balloon kit and about $45 for the slightly larger disposable tank that comes without balloons. If you are buying online, make sure to check the shipping costs! If you close the valve securely, no helium will leak out. So you can keep this tank for months, and keep filling your balloons (assuming that you just need a few balloons, e.g. to make a beautiful balloon bouquet). Unsure how to use the disposable tank? Watch the explainer video below. While you need more cash outlay up front, you'll get more helium for a lower price when you are renting a tank as opposed to buying a disposable one. If you have more than 50 x 9" or more than 27 x 12" latex balloons to fill, renting a tank is your best choice. If you need to fill fewer balloons, take the easy route and purchase a disposable helium tank.